Here is the way my Eclipse Award ballot would look, as of Dec. 30. Happy New Year to everyone. See you on the other side. Horse of the Year: Havre de Grace--It's been discussed at length how there was no true standout in 2011, but she is the best of the group. The decision by Rick Porter and Larry Jones to race her against males in the Woodward, and her subsequent win, was the clincher after nothing was decided in the Breeders' Cup Classic. Older Male: Game On Dude--Acclamation and Tizway are worthy opponents and would be deserving winners, but Game On Dude gets the narrow nod. 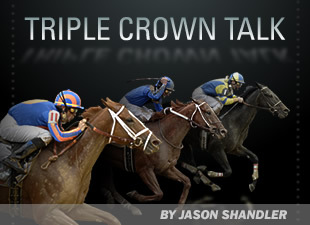 Two grade I wins and on-the-board finishes in seven of eight starts in 2011 with a pair of tough losses to go with it. It was a little more complete than Tizway's campaign, and Acclamation never won on dirt. Three-year-old Male: Caleb's Posse--In a year with no standout, he is one of only two 3-year-olds with two grade I wins (The Factor is the other). His devastating run in the Breeders' Cup Mile over Preakness winner Shackleford and thrilling score over champion Uncle Mo in the King's Bishop makes him a worthy winner. He had four graded wins on the year and ran 10 times. The same people who argue he didn't run at classic distances are the ones voting for a horse that didn't run past June 11. Who makes up these rules anyway? Stay Thirsty is my runner-up. Three-year-old Female: Royal Delta--Easy one here. The Breeders' Cup Ladies Classic was the deciding race and she was much the best. Two-year-old Male: Union Rags--Was narrowly beaten by Hansen due to a wide trip and poor ride, but his romping wins in the Saratoga Special and Champagne are enough to earn him the award. Two-year-old Female: My Miss Aurelia--No-brainer. Turf Male: Cape Blanco--Won all three U.S. starts in grade I company. Not a difficult choice. Turf Female: Stacelita--Not an overwhelming group to choose from, but her two grade I wins were more impressive than Dubawi Heights' pair. Male Sprinter: Amazombie--Breeders' Cup Sprint clinched it for him, but he had an all-around consistent season. Won the grade I Ancient Title, grade II Potrero Grande, and two other stakes. Deserving winner. Female Sprinter: If Turbulent Descent wins the La Brea Saturday I'll give her the nod. She didn't get a chance to run her race on the glue at Churchill Downs, so I can excuse her. A La Brea win would mean four grade I victories on the year. If she loses, I'll go with Musical Romance, the BC Filly & Mare Sprint winner. Trainer: Bob Baffert--He had a monster year from start to finish. Jockey: Ramon Dominguez--Javier Castellano really came into his own but Dominguez did enough to retain his title. Owner: Ken and Sarah Ramsey--Earned less than Godolphin and Midwest Thoroughbreds, but they had some awfully big wins this year, including the BC Juvenile Fillies Turf.